There are very few programming fundamentals but an infinite way of using and expressing them. I will start with two basic types – Strings and Integers. A string is an ordered sequence of zero or more characters. An integer is any whole natural number. Ruby is a weakly typed language meaning that you don’t need to predetermine a variables type at declaration, rather it is dynamically set (and reset) at assignment. #: a comment. Anything following the # is ignored. Don’t worry if all these terms don’t make complete sense yet. Strings can be changed and manipulated. The plus sign is concatenation eg. Appending a ! on the end will change the contents of the variable in place. This entry was posted in ruby, tutorial on June 7, 2009 by George Wright. The most recent versions of Netbeans (6+) have become very usable and are improving rapidly. Probably not as feature rich as Eclipse but faster and certainly not lacking in professional capability. 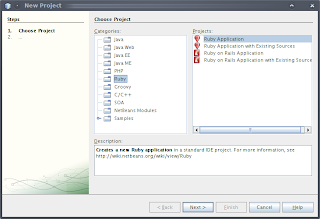 Netbeans is currently my IDE of choice for ruby and rails development. I intend to write a series of tutorials for my brother to gently introduce him to programming in ruby. Download Netbeans here. You have two choices you can get the Ruby package (about 60mb) or the whole suite (240mb). Give your project a name and a location to save it. In this instance I am calling it “RubyTutorial” and saving it in my “workspace” directory. Click “Finish”. Congratulations you have just run a basic ruby program. You can change what is between the quotes to anything you like. Press the run button (or F6) to see what happens. Any line beginning with # is a comment and won’t affect the execution of the program. 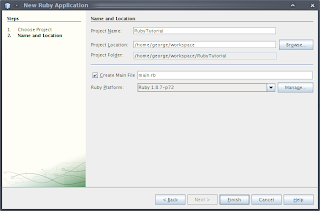 This entry was posted in netbeans, ruby, tutorial on June 6, 2009 by George Wright.